I saved my favorite scent of the bunch for last. I love LOVE a good coffee scent but I’m picky. I prefer coffee blends rather than straight coffee fragrances which tend to be too strong for me. Blends are perfect… they’re smooth with just the right touch of coffee to create that creamy/dreamy luscious aroma of starting a brand new day… and I always start each day with a fresh pot of java. Mmmm Mmmm!!! I consider myself a snob when it comes to coffee… I don’t like Folgers or any coffee in a can (Yes, I’m a coffee snob, I admit it). In general, I’m more of a Peet’s, Starbucks or Seattle’s Best kind of gal and prefer grinding my beans each morning. A royal pain sometimes but to me, worth it in the end. Sorry, but you can’t beat the smell or taste of a freshly ground pot of coffee. And man is that aroma to die for and I love it even more when I pour that first cup with flavored creamer! Did I tell you I’m into flavored creamer too? Oh yeah, totally! Can’t drink coffee without it… it’s the perfect sweetener and adds the right amount of flavor. My favorites are Vanilla Nut or my latest is Vanilla Chai Spice, um, YUM!!!!! So when I purchase coffee scented candles, that’s the scent I’m after. I think they could have splurged a bit more on their scent description because this scent was so much more than that. This scent is the perfect touch of vanilla with coffee and it’s very rich and dense but at the same time, not a strong fragrance. I don’t know how they managed that either. I loved this scent so much, I wanted it super strong and overall, I found the strength of this candle to give a steady medium throw… not at all what I’m accustomed to with coffee flavored candles. So if I could change one thing, it would be the strength. It wasn’t nearly strong enough for me. I do recommend Vanilla Cappuccino, highly in fact! And if you’ve been searching for a coffee scent but want something more subtle, this scent is for you. You notice the fragrance at all times but it’s not overpowering. Two thumbs up and one I’ll purchase many times over!! What a perfect fragrance this was and one I highly recommend if you love coffee scented candle. It was so creamy and delicious. It truly smelled like fresh brewed coffee with vanilla creamer. This was an awesome candle. It burned perfect, was authentic and gave a nice medium throw. Have you tried Vanilla Cappuccino from Pure Integrity? Review it with us. In the comment section below, review and star rate your experience… it’s easy! 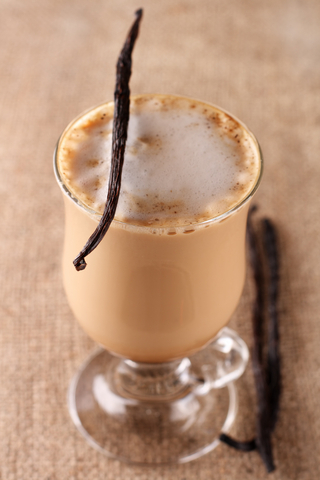 Vanilla Cappuccino scent description: Creamy vanilla artfully combined with gourmet coffee. A coffee lovers delight!